Yet another recipe from my new book. I got the ISBN number this morning. Ideally, I'll have it ready to go by Sunday. This is the bottling version of Barclay Perkins Burton. It’s surprisingly different from the draught version of KK, even though the two share a name. 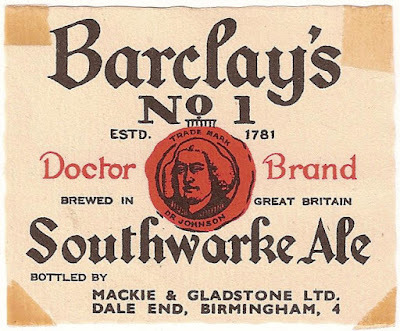 It wasn’t branded as Burton, however, being sold under the name of Southwark Olde Ale. The grist contains no amber malt and the sugar in No. 1 rather than No. 3. Though the brewing record does have “3” crossed out, replaced with a red “1”. Was that a mistake or a recipe change? The other photos I have of this beer aren’t much help. One lists No. 3, the other No. 1. Another big difference with the draught version is the lack of dry hops. This isn’t unusual. Bottled beers often lacked the draught version’s dry hops. There are more copper hops, however. 8.85 lbs per quarter of malt as opposed to 8.35 lbs. Not a massive difference, but I’m sure it’s no mistake. It may look modest today, but 1047.5º was a pretty huge OG in 1946.
if the caramel was any darker, the colour of the finished beer would be way too dark. I know how much caramel was used and what the final vcolour of the beer was. I worked back from that.